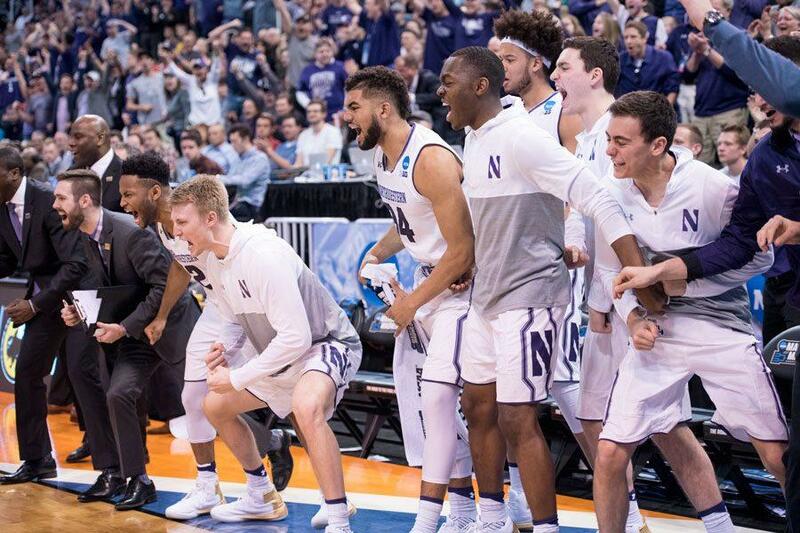 Northwestern's bench celebrates. In their first NCAA Tournament appearance in program history, the Wildcats topped Vanderbilt. SALT LAKE CITY — In its NCAA Tournament debut, Northwestern showed it belongs. The Wildcats (24-11) led Vanderbilt (19-16) for more than 38 minutes of game time in Thursday’s first round matchup. They put on a strong defensive showing against the Commodores’ cast of shooters on one end and rode a vintage 25-point performance from Bryant McIntosh on the other. And when the game got close at the end, NU didn’t buckle under pressure. Instead, it hit 5-of-6 free throws in the game’s final half-minute, including the decisive go-ahead pair from McIntosh in a 68-66 first-round victory for the Cats at the Vivint Smart Home Arena. NU did its best work on the defensive side, bottling up a dangerous Vanderbilt offense for most of the day with physicality and a switch-heavy gameplan. The Cats held the Commodores to a 38 percent clip from the field and just 35 percent from 3, a sturdy performance from a squad that has emerged this season as one of the Big Ten’s top defensive units. With its defense locked in and McIntosh clicking from the tip, it looked for a moment as though the win might come easy for NU. A 3-pointer by senior forward Nathan Taphorn off a rebounded free throw brought a large, raucous contingent of traveling Cats fans to its feet, putting NU up 15 just over six minutes into the second half. But just as the Cats seemed poised to cruise to a first-ever NCAA Tournament win, Vanderbilt had other ideas. A 12-0 run by the Commodores cut NU’s lead to 49-46 just after the under-12 media timeout in the second, capped by a pair of 3s from junior Matthew Fisher-Davis, Vanderbilt’s leading scorer. The guard hit a litany of tough shots after halftime to keep the Commodores within striking distance late, and a 3 by fellow guard Riley LaChance put Vanderbilt ahead 62-61 with 1:36 to go. Suddenly, a game that could have ended as a blowout became a test of NU’s ability to close. The Cats turned to McIntosh down the stretch, and as he has so many times before, he delivered. The junior guard got into the lane for a floater to retake the lead, and on the next possession his penetration opened a lane for an offensive rebound and putback attempt for sophomore center Dererk Pardon, who sank both free throws after the ensuing foul. McIntosh’s heroics were matched by the Commodores, though, and LaChance hit a layup to give Vanderbilt a 66-65 lead with 18 seconds remaining. But as NU’s point guard dribbled up the floor with the game in the balance, Fisher-Davis made a major error, intentionally fouling McIntosh as though his team were behind. McIntosh didn’t squander the opportunity, nailing both free throws to nose the Cats back ahead. And with a fitting chance to win the game on defense, NU forced a missed 3 from LaChance to seal the victory. NU’s prize is a Saturday second-round matchup with Gonzaga, the West Region’s No. 1 seed. But as Collins and his Cats left the court to roars from the NU fans in Salt Lake City, it was clear that the win meant more than that.